Annual chocolate consumption in the United States is around 5.5 chocolate bars per capita — the equivalent to about 120 chocolate bars per person, every year! According to the National Confectioners Association, Valentine's Day ranks as the 4th largest candy selling holiday, behind Halloween, Easter, and Christmas. It is estimated that 58 billion pounds of chocolate are sold for Valentine's Day alone, making it the top-selling gift for the holiday, turning what was historically an occasion to give a small token of affection into a lucrative market. Sales for the Valentine's holiday make up only about $1.7 of the $50 billion in annual sales of sweets though, according to the National Retail Federation. In the United States alone, there are almost 1,300 locations that produce chocolate and cocoa, helping satisfy the American sweet tooth. Although the American affinity for chocolates is undeniable, Europe actually accounts for about 45% of worldwide consumption, about 4% more than the US. Each facility has numerous belts and applications in use throughout their chocolate manufacturing process. Different types of belts convey the chocolate from the forming press to the cooling tunnel, and on through the process of packaging them for shipment. 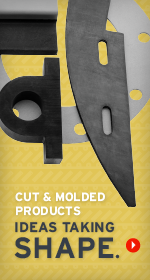 For inclines, tight transitions, inspection lines, and positive drive applications, our line of Volta products and fabrications provide excellent options for your customer. Once the product is produced, and ready to be packaged and shipped, we offer a variety of custom covered products that will solve any of your customers’ problems.